The danger is that both parties have decided that the only way for them to achieve their much coveted Amnesty for millions of illegal immigrants is to allow Obama to dictate it. The Republican leadership will, of course, continue to make loud noises of complaint, but in the end not overturn it. The vehement protestations of John Boehner and some other leading Republicans is just political theater for the distraction of the electorate, with a wink and a nod to Obama. An Obama-dictated Amnesty would very much please the anti-American international financial interests that line the pockets of corrupt leading politicians of both parties. The old inveterate liar, John Boehner, is finally talking tough on Amnesty and Obamacare, only because his re-election as House Speaker is coming up in January of 2015. He needs to be replaced with someone more trustworthy. There have been several attempts to give millions of illegal aliens amnesty by leading Democrats, as well as Republicans. The Republican leadership tried, but failed, to pass an amnesty under George Bush when the Republicans controlled both houses of Congress. The rank and file revolted against it. The leadership of both parties are controlled by international financial interests and the Big Money supports massive illegal immigration into the United States for the cheap labor. Both party leaderships want millions more uneducated passive peons as voters in their constituencies, because they are less demanding and more easily controlled with government handouts. The current political elites of both parties admire the third-world dictatorial political model and want to install the same kind of government in the U.S.
Obama is, himself, saying his amnesty by dictatorial edict would only be “temporary,” but as Napoleon once said, there is nothing quite as permanent as a temporary solution. It would attract a massive wave of more illegal immigration and make it much more difficult to overturn Obama’s dictatorial action and deport the even more massive numbers of illegal aliens in the future. If the politicians of both parties were serious about fixing the illegal immigration problem, they would start obeying the law and deny benefits to illegal aliens. 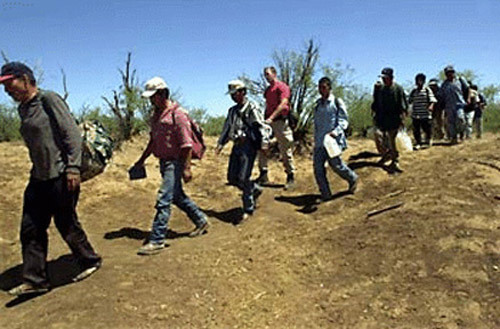 It is already illegal to aid and abet illegal aliens to remain in the U.S. However, governments at all levels have been handing out benefits to illegal aliens that enable them to stay in the U.S. and attract millions more of them to come. This is not just a failure of politicians to enforce the law. Many politicians are actively and wantonly breaking the law and the guilty parties belong therefore in prison. Securing the border would be relatively easy and inexpensive, if Governments would stop illegally enticing illegal aliens with ever increasing government benefits. California has recently passed laws to give illegal aliens drivers licenses and trade licenses, which violates federal law against aiding and abetting known illegal aliens. In California they are building separate DMV’s, just to accommodate the millions of illegal aliens here. This will throw a large number of low-skilled Americans out of work and often into the streets for the benefit of illegal aliens and enticement of more illegal immigration. Given that the current massive illegal immigration represents a serious threat to U.S. sovereignty, encouraging more of it should be considered, in fact, a treasonous act and the politicians, who support this, should be punished accordingly. Let’s call it what it is, lawbreaking and treason. I would love to see Someone in Washington with the B-lls to enforce the Law instead of playing these stupid games. Why do They bend over backwards to not do what is right? Jefferson and the rest are spinning in Their Graves when They see what has happened to this Country. Both sides should be ashamed of Themselves. It’s because they are corrupt and have gone over to the other side to sell us out. Is that so hard to understand? Why do Americans think they can never be hoodwinked and sold out. It’s very naive.